Two others signed up for this Labor Day holiday weekend, Climbing-Knapsack Section trip. 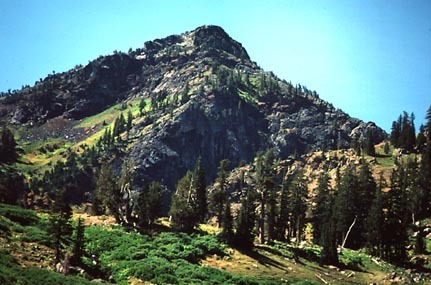 We were to make day peak climbs about the Klamath Mountains. The local chapter never does this, even though huge tracts of scenic wilderness are located here. I was of the mind to visit as many wilderness areas as I could. They generally are drawn about a high, alpine area. The Forest Service and the logging industry will allow places that don't have many trees to be withdrawn from such uses. While remote stands of certain species of pines and other assorted trees are officially preserved, often their market value as timber is low, and the effort to log them is uneconomical. Leaving after work Friday as usual, I didn't have to drive this time. We three carpooled in a larger wagon, courtesy Roger. We drove through Weaverville, CA, and headed north along Highway 3. We camped during a very dark night, somewhere enroute. There are many official campgrounds along this highway. We drove on, the next morning, into the small town of Callahan, CA. 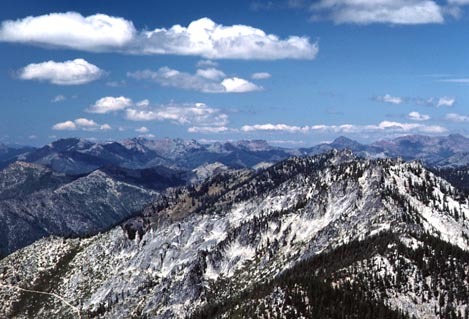 A view south offers a view of a beautifully forested Craggy Peak (8,098'). A good photo of this fairly immense, smoothly treed slope would be worth the trip back! We took the road north to Etna, which offers a fine breakfast spot. A road then goes west toward Cecilville. The drive alone is scenic, and I wish to visit this area again. Parking at a trailhead for the Pacific Crest Trail, we hiked north on the PCT for several miles. We chose to take an unsigned, short use trail to Bingham Lake. We then made a cross-country ascent, through agonizing amounts of thick, mixed brush and talus to the summit of Russian Peak. This is the highpoint of the Russian Wilderness. We had really accomplished something to get here! We enjoyed the views, and I placed a register. The PCT was seen below, to continue along the mountains. It made a visible, thin, cut where the trail was built. There was a nice view of Mt. Shasta to the east. On the return hike, we noticed some tree stumps, but a whole different ecology. The view to preserve the highly varied, remaining, eco-systems of the State was well worth my modest dues. I contributed to a few, wilderness promoting, organizations. Back to the car in due time, we passed through Etna, CA, and found another car camp spot, and had a peaceful night. The next day, we motored west along the Scott River, from Fort Jones. We took USFS roads to the trailhead for Boulder Peak, the highest point in the Marble Mountains Wilderness. We found the start point easily enough. Sometimes, the USFS maps are good! The trail climbs steeply through forests, and then breaks out to more open country. We reached Boulder Lakes, and had a view of the peak above. Being a long way from the major cities, we never saw anyone else hiking, even on this big holiday weekend. The trail climbs around to the east of the highpoint, and then passes very closely to the top. Only a short, forty foot vertical or more, off-trail scramble is needed to gain the exact highpoint. I placed another register. It may be remarkable, if returning in many years, to find books signed in by hundreds. A good view toward Mt. Shasta and the Scott Valley is seen. The weather, again, was gorgeous. I took a photo of a plant that I had never seen before. Descending, we made a loop going down a trail on the west side of the peak. At a point, we then hiked cross-country to regain our ascent route. A well lighted snag made a photo subject. Cows in a meadow grazed, as witness to our passing. Back to the wagon, we now headed out east to Interstate 5. The plan was to head south. Camping somewhere, our next and last day's activity was to hike in Castle Crags State Park. We arrived there early in the day to beat the heat. The well-built trail to the base of Castle Dome ascends a couple thousand feet over a few miles. I had heard that the summit of the Dome was a class 4 climb. Therefore, we didn't attempt it, since I didn't have a rope and hardware along. I was to return in July, 1995, to find that the climbing was more like class 3, with the route-finding the real problem. Pity for the others that we weren't, then, more adventurous. We gained a nice view of Mt. Shasta again, and a close-up view of the other crags. Rock climbing opportunities are said to abound here. One best experiences the Crags by doing this hike. They are huge. We hiked quickly back to the wagon, so finished the activity and headed home. A climbers' guidebook to the Crags declines to give the route directions for Castle Dome. There are indeed spots where if one slipped, it would be a long way down. The printed rationale is that the guidebook authors didn't want to be liable for accidents of beginners. People might climb to the top, but get stuck trying to descend. An ad that I saw recently, in a local Redding tabloid, tried to sell cellular phones with a depiction of a hiker calling to be rescued from Mt. Shasta. We don't want to be a part of that, either. While there can be legitimate reasons for an emergency rescue, most result from some moronics. I have heard a chapter chair declare, "We'll be rescued as many times as we please." They say that they pay taxes, too, so why not? Malicious people will say that there'll be a helicopter waiting at the top. And, that the aerial ride out will be a big "surprise," so not to ask about it. Misinformed hikers will then demand to be rescued, since hiking is "such a pain." At what, $500 or more per hour flight rental, we can't be responsible for what hikers refusing to continue. When you climb a mountain, yes, you have to climb back down, as well! There is little financial responsibility with many hikers. The world for them, and nothing for everyone else! I suppose the many Club volunteer legal services could be used to resist any rescue expenses billing. With the local chapter well connected with government officials, they could call off the dogs!